The air war in Europe helped decide the outcome of the war. From the early dogfights between Spitfires and Messerschmitts in the skies over Britain to the bombing raids and fighter escorts late in the war, the history of this monumental conflict is rendered in striking detail and authenticity by the master model makers at Corgi. Corgi aircraft come with retractable landing gear (where applicable) and a handsome display stand. The "Mossie," as it was known affectionately by its British crews, was both simple in construction and design. It was a twin engine, single boom aircraft that placed the pilot and navigator in a side-by-side sitting configuration. 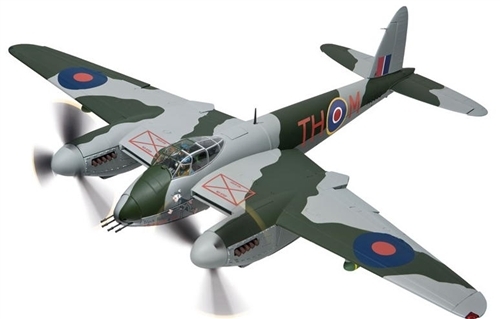 The Mosquito was one of the most cost effective aircraft ever built because it was constructed out of wood. Our Price: $259.99 Sold Out!